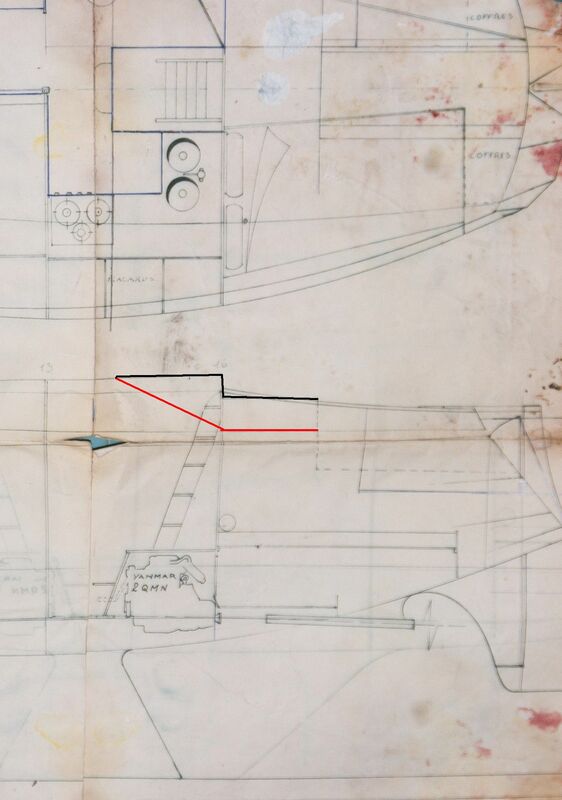 A section of one of the original plan sheets showing the original cockpit concept. When ‘Morgane’ was designed she was drawn with a small cockpit, a deck hatch as an entrance companionway, and an aft cabin. This would have given a deep and protected cockpit with a high bridge-deck (the black line on the drawing) between the cockpit and the companionway. Getting from the cockpit to the companionway would have been scary in any kind of seaway. As far as I know she wasn’t built like this; instead the builders dropped the bridge deck to the same level as the cockpit seats and sloped the companionway hatch (red lines on drawing). This made a much more protected bridge deck but made building the aft cabin impractical as it removed the head-room in the access way behind the engine. 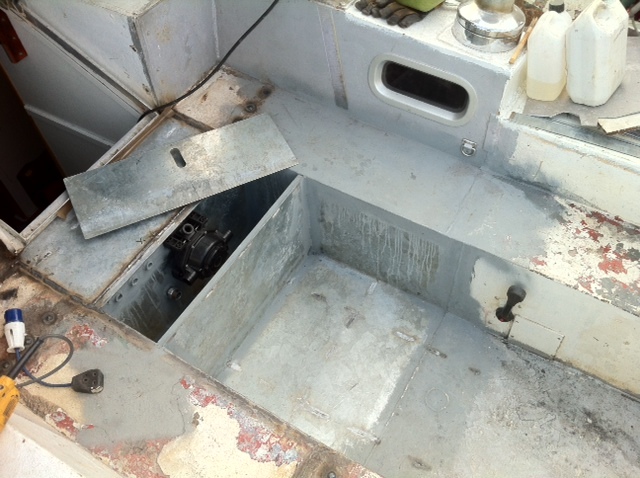 They instead opted for a hatch in the deck outboard, over where you see the double bed in the plan, and formed a lazarette (a useful place on a boat where you store junk broadly equivalent to a garden shed!). We found the bridge deck to be too big, the area under it to be a waste of space and as we are heading to the tropics we wanted a bigger cockpit and more comfortable seating under our hard dodger. We discussed various ideas ranging from a full pilot-house to doing nothing. 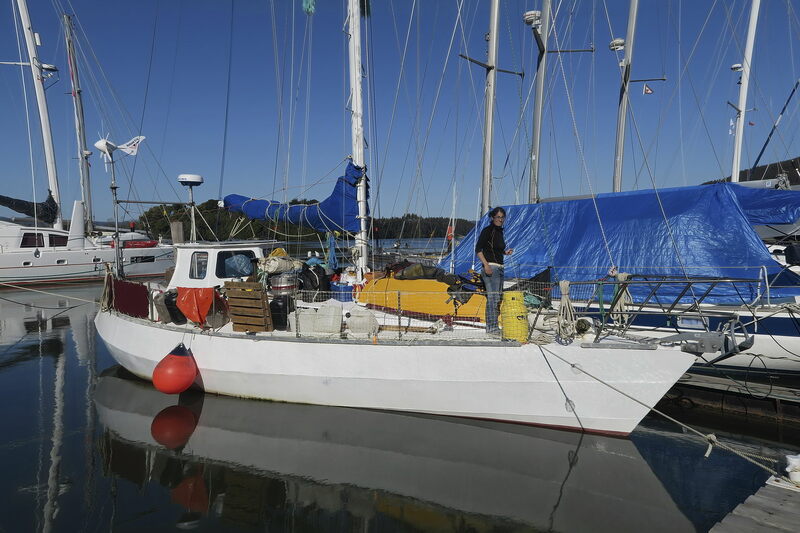 The full pilot-house idea is outside of our budget right now but if we head back to high latitudes again and have cash it might just happen. 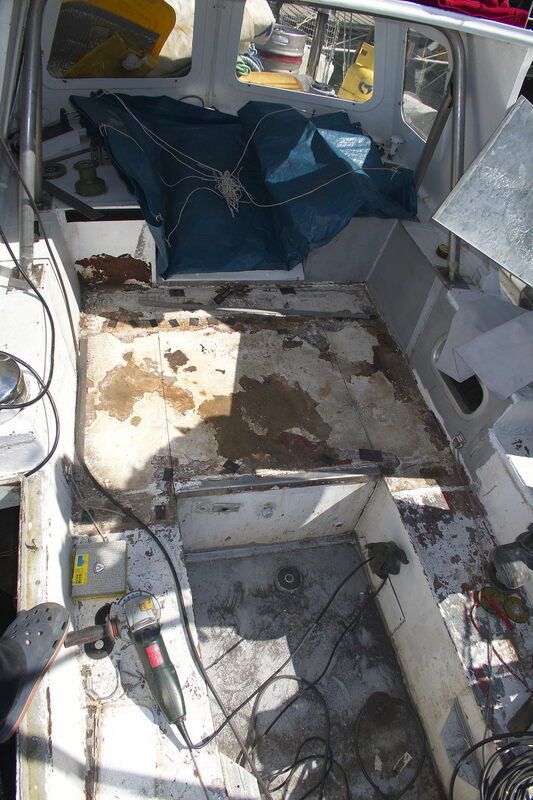 We decided to extend the cockpit forward half a metre and also to build a protected locker at the forward end to house the cockpit bulge pump, fuel filler, various tank breathers, the electric bilge pump outlet, and perhaps an engine room air intake if we find we need one. This would give us more cockpit seating extending forward to just under the dodger whilst retaining a bridge deck for safety and decluttering the cockpit. I decided to make some 3d drawings to make sure that both Paula and I were on the same page and to show any potential contractors. I gave myself a crash course in Sketchup , got busy and ultimately came up with the following drawing. The companionway would be at the left of the drawing and the transom of the yacht on the right. The green colouring shows the area to be modified. My design for the cockpit extension. The whole of the green area would have to cut away a new box structure formed from new 3mm galvanised steel sheet and welded into place. All of the openings in the forward end for the plumbing would have to be planned and put in place before installing the forward bulkhead. Various stringers and ribs (not shown) would also have to be added underneath to stiffen the cockpit sole. 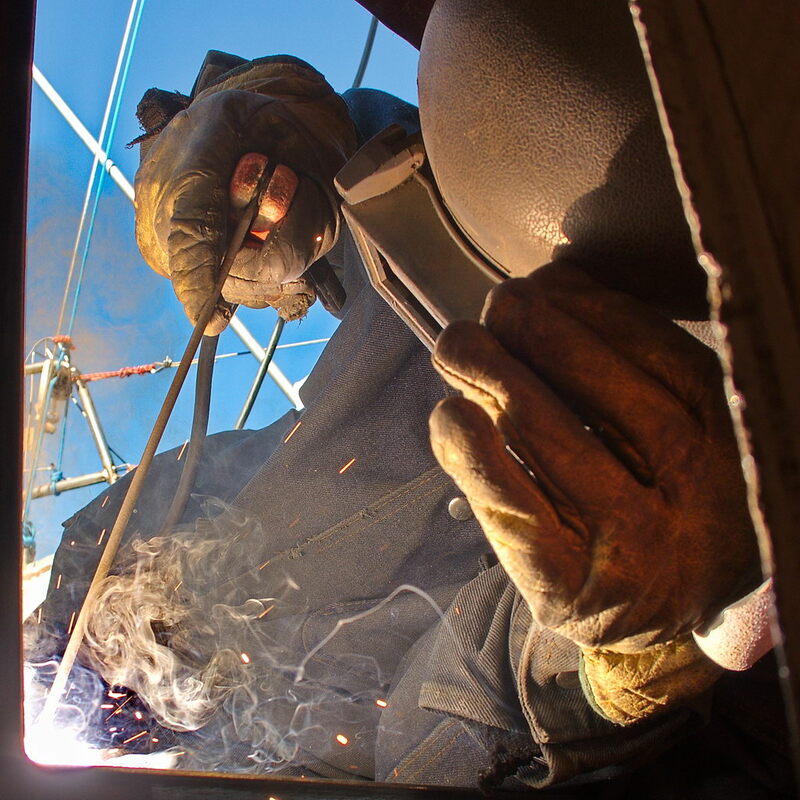 We asked around and were introduced to a welder named Claudio who came and looked at the job and gave us a quote that we accepted; but he could only work evenings and weekends. This was back in May but at that time of the year the climate wasn’t suitable for cutting a hole in the boat so we agreed with Claudio that we would give him a shout in the spring. Spring hadn’t quite arrived but it was in sight so we shouted for Claudio anyway. He could do the job but wanted to get started as soon as possible as he needed the job completed by the 18th September ( a big holiday weekend here in Chile). Before Claudio could get started we had to go out and buy a sheet of 3mm galvanised steel, some consumables; such as cutting and grinding disks, welding rods and such. That required another visit to Valdivia’s Picarte street where we found everything we needed in a steel yard. Another trip was required to a ferreteria for some galvanised plumbing fittings to make the through bulkhead fittings (we planned on welding in pipe couplings so that threaded parts could simply be screwed on.) Next we had to clear out the lazarette to remove all the flammable (and valuable) things stored in there, dismantle some of the interior furniture and find fire-proof covers for what we couldn’t remove. After all that unpacking the boat looked like a floating jumble sale! In the meantime Claudio spent a couple of evenings cutting the panels out of the sheet of steel and prepping it for welding. The big day arrived and we marked out the area to be chopped out of the bridge deck and got busy with the angle grinder. You can see the lines marking the area to be removed in the photo below. The steel of the bridge-deck is in such a bad state because the previous owner had bolted a piece of aluminium sheet over the top, presumably because he was fed up fixing rusting paint chips; I had been afraid to remove it previously! We hacked out the area and then offered up the bottom and sides of the extension that had been pre-formed by bending the bottom and sides from a single piece thereby avoiding two long welds in the bottom of the cockpit. A few snips and grinds here and there and it fitted. Then we made up the two bulkheads that would form the box at the forward end and cut the holes for the fittings; which were then welded into place. By the end of the first full day we had a lot of metal and paint dust and the structure of the whole thing tacked into place. You can see the pipe couplings welded into the forward bulkhead where various tank vents and the electric bilge pump outlets will go. Hidden from view in the bottom of the box are the fittings for the fuel filler and the pipe to the manual bilge pump. You can also see the hole where the old fuel filler used to be just aft of the new/old join. Day two was mostly taken up with Claudio welding all the joints and Paula and I doing fire watch. 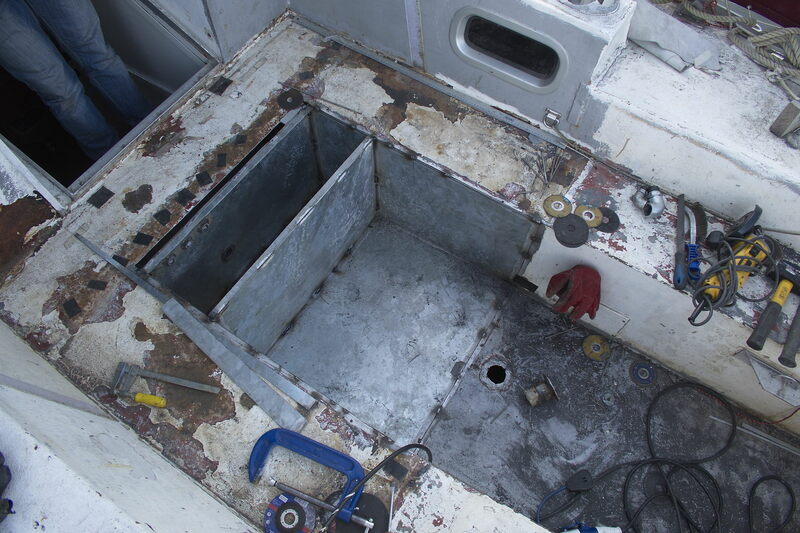 Over the next three evenings the welds were finished and the old piece of steel between the new forward edge of the cockpit and companionway hatch replaced. The stringers and ribs (frames maybe?) were then welded onto the underside of the cockpit sole. By the end of Claudio’s role in the project we had result shown in the following picture. 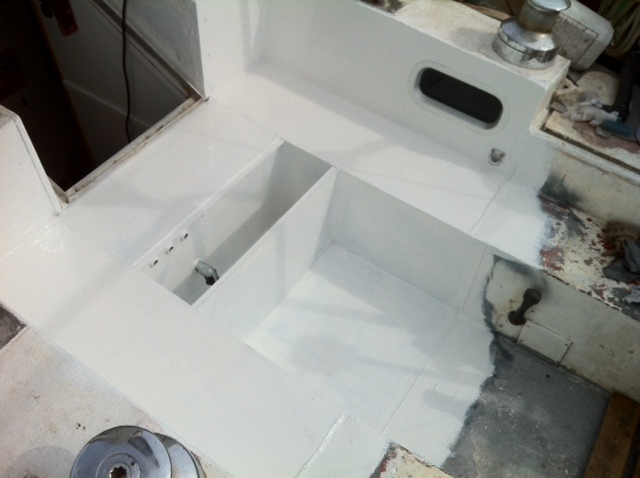 You can see the manual bilge pump in position and the lid of the box with the slot for the handle. Some primer on, pump test fit. Another couple of days of prep work and we finally had a coat of paint on. 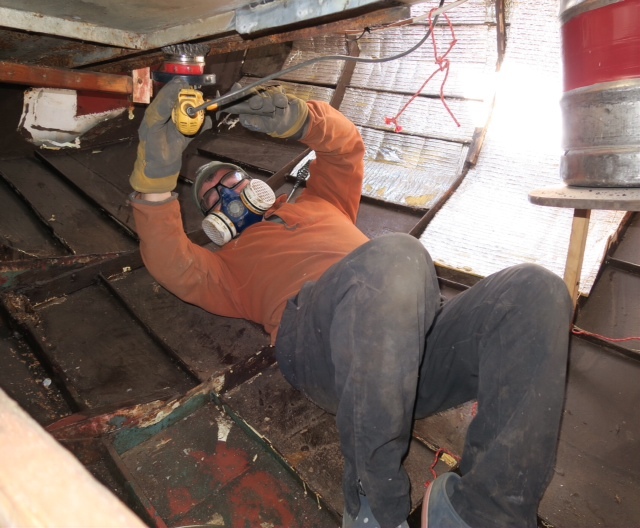 Given the dampness of the climate here, and the fact that we hauled the boat out of the water this weekend we didn’t have time to prepare the whole cockpit for new paint but it was imperative to get the new work covered as soon as possible. 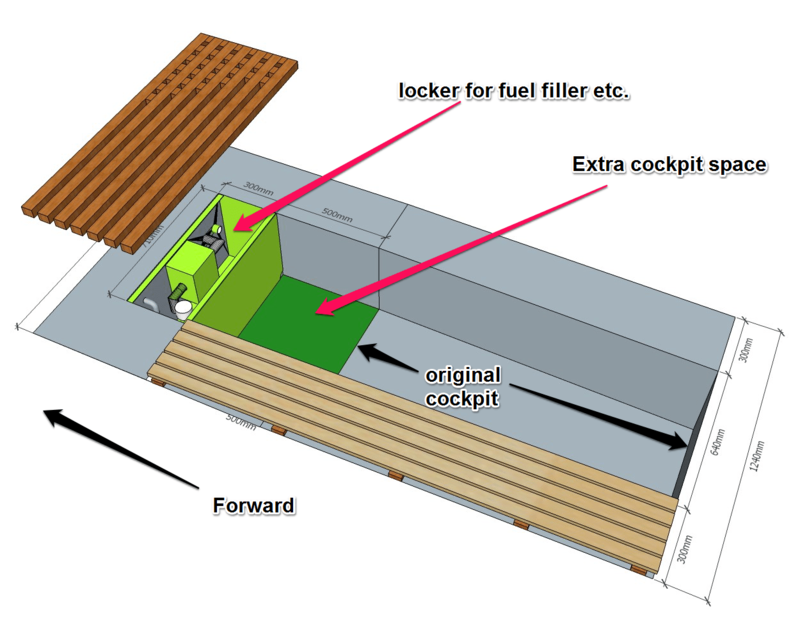 We are going to put a wooden grating on the bridge-deck and wooden slats on the seats on the cockpit sole. I’ll add some pics when it’s all done. I have to say that we had a glorious week of sunny weather for this project and if that hadn’t happened it would have been a much more miserable experience than it was (living on the boat with all this happening wasn’t easy). The underside of the cockpit was also wire-brushed and prepped and has been given a few coats of paint too; dirty uncomfortable work. Wire brushing the underside of the cockpit sole.